The Honeypot Nurseries are a small chain of 4, each hosting a vast array of experiences for your child. The Honeypot Nurseries are owned by Kenneth Taylor and overseen by the Area Manager Sheila Gordon. Kenny and Sheila have worked together since the first Honeypot was founded in 1994 and the nurseries have gone from strength to strength. 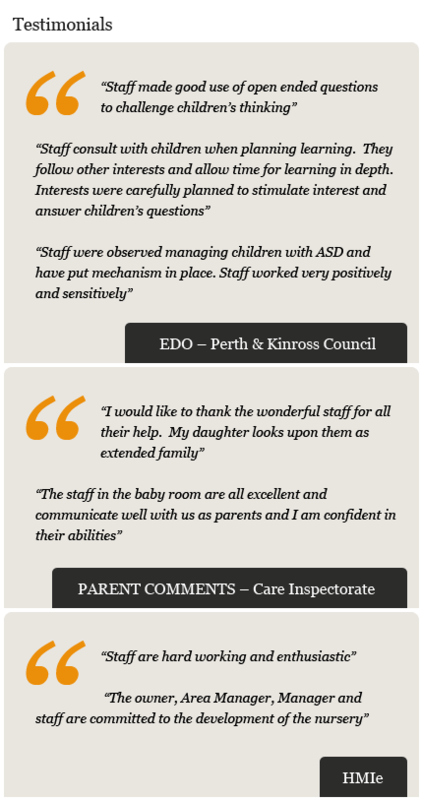 Each nursery is individually run by a team of Managers and qualified staff with up to 25 years childcare experience. The Honeypot Almondbank is situated within an attractive building which has separate facilities for Babies (0 - 2yrs) Tweenies (2-3yrs) and Pre School (3 - 5yrs). There is an outside play area complete with challenging equipment and a heuristic reading/circle time area. The children are also encouraged to explore, plant and grow their own produce within the raised beds and greenhouse. A free door to door pick up & drop of service is available for children attending Almondbank Nursery. The Honeypot Luncarty is in a rural village and has an old school house feel. Within the nursery there are two rooms for Babies and 2 - 5's. There is an outdoor play area to the front of the nursery which is both inviting and secure. The nursery is ideally based to allow children nature walks and outings to the nearby environment. The Honeypot Scone is ideally situated and was refurbished to accommodate separate facilities for Babies, Tweenies and 3 - 5 year olds. The nursery has a separate room for physical play which extends on to the outdoor play area. Children also make good use of the outlying environment. Scone nursery also provides a free door to door pick up & drop of service for children attending full days. The Honeypot SSE is exclusively for children and parents who are employed by Scottish & Southern Energy. They offer care for Babies, Tweenies and Pre School children. (Prices are subsidised by SSE) The nursery has a security system in place to ensure the safety of the children. An inviting outdoor play area can be accessed from all play rooms. All nurseries are in partnership with Perth & Kinross Council and offer funded places to children aged 3yrs and over. Our Registration and Administration Policy contains a range of useful Parent Consent & Permission forms to along with admission information. Our advisor will contact you at a convenient time for you.